Major Millions could rightly be the highest paying progressive jackpot slot in the world today, and we’re taking a little look inside the world of Major Millions to find out why that is. Major Millions slots is one of Microgaming’s finest crowning achievements. This massive progressive jackpot slot game arguably has one of the biggest progressive jackpots to be found on any online slot, in any online casino. Major Millions has spawned several spin-offs, sequel and side slots, all with equally impressive gigantic progressive jackpots. The Major Millions Classic slot comes in both three and five reel forms. The three reeled Major Millions Classic slot has three pay lines, and a progressive jackpot of 50,000 coins, which in real money comes to an impressive £250,000, and of course, it is often so much higher, with the biggest reported win coming in at over one million eight hundred thousand Pounds. 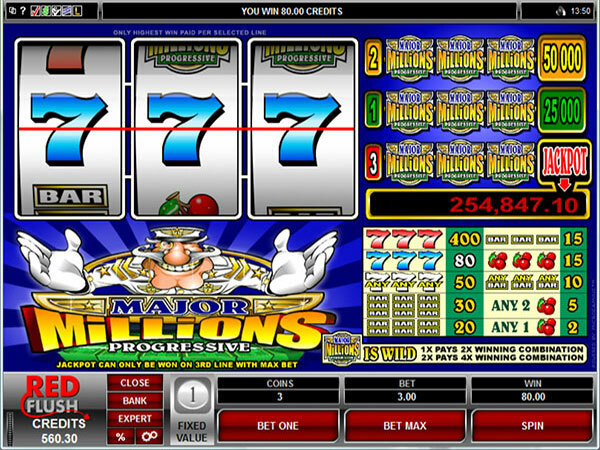 The Major Millions Classic slot that contains five reels is even more impressive. With more reels and more pay lines there is obviously a greater chance of winning. However with this enhanced winning capability comes a higher cost per game. With a 250,000 coins progressive jackpot, wild symbols, multipliers and scatter symbols, it could be argued that this is most popular of the classic Major Millions slots. There are a total of fifteen pay lines available in this larger big money progressive jackpot slot from Microgaming. Whilst there have been plenty of Major Millions slots released over the year, one of the more successful ones includes Major Millions Megaspin. Major Millions Megaspin is a three reel, three pay line progressive jackpot slot game that contains six individual slots in one, hence the title. 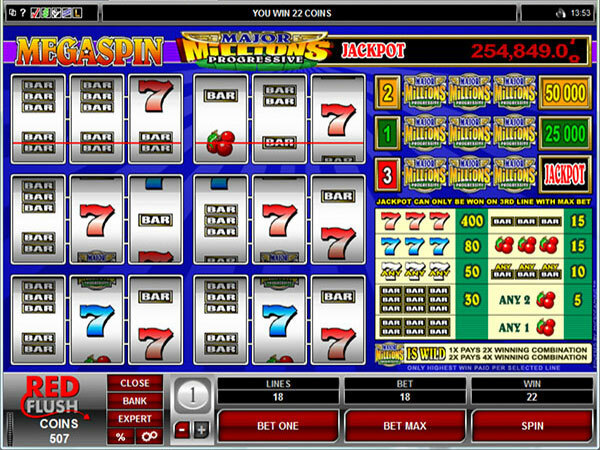 Megaspin Major Millions allows you to play six different slot games in once, and has the usual wild cards, scatter symbols and multipliers that you’d get with a typical Major Millions game. The progressive jackpot is worth 50,000 coins and the game can be played from as low as 0.60 per spin, up to a more typical 18.00 per spin.